You have the freedom to achieve the look you want. Don’t let money stop you from feeling better about yourself and improving your outlook on life. Financing is available! Skin Vitality Medical Clinic is pleased to offer you the flexibility of 0% financing for all of the aesthetic medical treatments and services we offer. From Botox or fillers to erase the signs of aging on your face, CoolSculpting to eliminate unwanted fat from problem areas or Fraxel to even out skin tone and texture…you can get it all done without the worry of budget constraints. Want to see how much you can get approved for? APPLY NOW AND DECIDE IF YOU WANT TO USE LATER. The possibilities of how you can improve your appearance are endless! 0% financing allows you the freedom to look better and feel better anytime. You won’t have to worry about paying for your treatment or inflated interest rates. Our financing program works on a monthly payment plan. Your plan can be adjusted according to your specific needs. Payments are generally made over the course of your treatment protocol. You may also choose to pay over a longer period of time in the event the amount to be financed is higher. 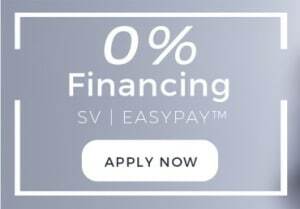 To find out more about the 0% Financing SV | EasyPay™ program and the flexible financing options we offer, contact us at 1-877-356-7776 or book your appointment here.